This is the magazine I was a columnist in until it was taken over by a new publisher and this is what one reader wrote (if I don’t blow my own trumpet, who will!). “I have just received the first issue of f2 Freelance and Digital since it was taken over by EC1 Publishing and was disappointed to find that your column is no longer included. It was always the first article I used to read when I received the magazine. As a photographer just taking his first steps in the freelance world, I found your advice and suggestions invaluable and always presented in a very easy to read style. You may be pleased to know (or possibly not) that I have taken a number of your ideas and adapted them to suit my own style. I hope you don’t mind. Anyway just to say that I will miss your words of wisdom in the future, but many thanks for all of those in the past. Best wishes for the future and happy freelancing. It has now been re-purchased by its founder and is being relaunched in a format similar to its original. Hereunder is the media release. 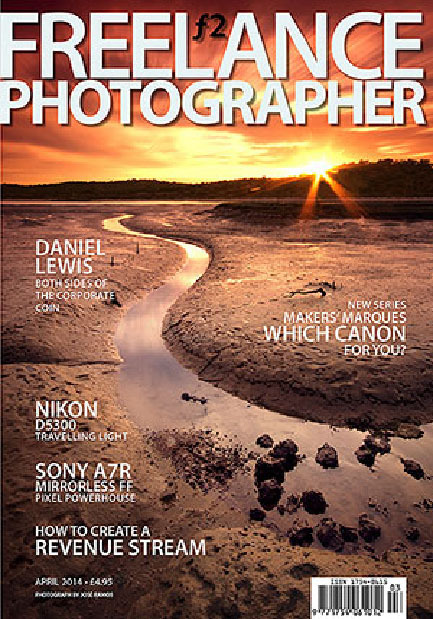 A new design, more lively and varied approach to content, and a return to the old values of our magazines will make f2 Freelance Photographer essential reading from the April 2014 relaunch issue onwards. This will be go on sale in the first week of March through newsagents which already stock f2, and will be available on Icon Publications Ltd’s stand K18 at The Photography Show, NEC, Birmingham March 1st-4th. On January 24th, editor David Kilpatrick learned that EC1 Publishing Ltd, who took the magazine over in 2006, were shutting up shop and would cease publication. He immediately arranged to recover the title, to reverse the changes in editorial style, typography, layout, and picture choice – growing the circulation once again. The new f2 will have more technique and technology, more interesting images, and better print quality with 150g silk paper, matt lamination and perfect binding. It will return to 6X a year from May 2014 onwards, with a May/June edition following the April one. See us at The Photography Show, or subscribe on-line by Paypal to any of Icon’s three magazines by visiting Icon Publications Ltd website (www.iconpublications.com/). Special offer for the show, available now on-line – subscribe to any two magazines and we will send you the third free of charge for a full year… supermarket stlye 3 for 2 offer, only this is not just three different variations of asparagus! This offer is limited to UK subscribers. Please note that if you have a Cameracraft subscription in the UK, and subscribe to f2 Freelance Photographer, we will send you one year of Master Photography free of charge!